Kidney disease isn’t curable, and families of children with kidney disease will spend months at a time in the hospital, followed by years of managing daily treatment. It’s exhausting and scary, which is exactly why such families need support from people who understand what they’re going through. Northwest Kidney Kids, an Oregon-based non-profit, connects families affected by kidney disease at their annual summer Kidney Kids Camp. This important event is free thanks to two yearly fundraisers -- a gala ball and a fun run. Jill Brown and Lauren Lynn are especially suited for working at NW Kidney Kids because they both have young children with kidney disease. We spoke with these two women at the start of National Donate Life Month to learn more about planning fundraisers and the very important reasons why they do this work. What is the mission of NW Kidney Kids, Inc.? You are both mothers to children with kidney disease. Is that how you originally became involved with Northwest Kidney Kids? Jill: Yes. I never thought I would be personally mission-connected to my work as I am now. When my daughter, Kylee, was two, she got really sick. I continued to try to work for my previous employer, March of Dimes, Oregon Chapter, but her healthcare needs were too complex, and I had to take a step back. At that time, Kylee was on dialysis. I started talking with the NWKK Board President, who is also a pediatric nephrologist, about how I could help support the organization. I loved the idea of taking my knowledge from working in the nonprofit sector and applying it to this organization. I started by working ten hours a week focus on our main fundraising event, Kidney Kids Ball. I could balance my work with getting my daughter through her kidney transplant for which I was her donor. Over the years we have increased our fundraising and programs, and in 2015, I became the first Executive Director and now work an average of 30 hours a week. Lauren: Shortly after moving to Oregon in 2013, our two-year-old daughter, Helen, got really sick. We went to the pediatrician and the ER twice. When they finally took labs, they realized she was in kidney failure. I also happened to be three-months pregnant at this time. Helen spent 60 days in the hospital with hemolytic-uremic syndrome caused by an e. coli infection. This syndrome causes red blood cells to die, clogging up the kidneys and leading to life-threatening kidney failure. I happened to meet Jill, who was in the same hospital donating a kidney to her daughter. Jill hunted me down in the hospital to tell me about NWKK and about this camp for families who are dealing with kidney disease. When Helen was stabilized, I was able to start working at NWKK. I had the flexibility to go to the hospital with her regularly, and I could also work from home. You both understand how to best support families with children who have kidney disease because you’ve been through it, too. Lauren: When you’re in this crazy world you feel so isolated, and no one truly knows what you’re going through unless they’ve also gone through it. When your child is in the hospital for 15 weeks, they can’t leave -- and you can’t either, except maybe to go home to shower or see your other kids. I stayed at the hospital 24/7. How do you have any sense of normality when you’re in the hospital and there’s a new touch-and-go situation every single day? NWKK families all speak the “medical immersion” language we learn from being in the hospital for many weeks. Before then, I didn’t know what kidneys did or how dialysis worked. Now it’s hard to talk to someone who doesn’t know the language. Jill: We learn from each other. Parents of older kids who have been through some of the challenges we are currently facing can offer insight. Now, as our kids are getting older, we can help parents with younger kids. The cycle is continuous, and NWKK is here to support those parents and meet them where they are in their journey. Kidney disease can happen at any age, so we are here to help families connect. Why is Kidney Kids Camp so important to you and other families? Jill: We run a weekend family camp and a five-day youth camp just for middle- and high school kids -- parents don’t attend. Most of these kids have never been away from their parents before. We have nurses and CNAs, and all the counselors have a connection to kidney disease or have it themselves, so they can be mentors and role models. My favorite part is the youth camp. It’s amazing to see 20+ kids come together. It’s about more than just sharing their experiences. Camp is where they find their voice. Often these kids had their transplant when they were two, three or four, and they don’t really remember it. They only hear the stories their parents tell. At camp, we do a lot of storytelling, and the kids finally learn to tell their own stories. A lot of the kids know nothing about kidney disease, so we help them understand it and teach them to care for themselves, too. Lauren: When I first attended camp I thought, “Here’s a place, finally, where I feel like we can do this. I have support. We’re not alone!” Seeing the teens is the most inspiring thing for me -- they are surviving and thriving even after multiple kidney transplants. I was grieving what my child couldn’t do, like going to the lake and playing in the water. This wasn’t the life I anticipated for her. At camp, seeing these older kids doing all the things I thought Helen wouldn’t ever be able to do was so hopeful. Your upcoming ball is your biggest fundraiser of the year. What does it take to organize something like that? Lauren: Jill should answer this, as the ball is her baby! My answer is lots of volunteers and good leadership. Jill: It starts with a great team. Through our Board of Directors, we put together subcommittees to focus on event design and procurement. The Board and I work on sponsorship and selling tables/tickets. It takes a lot of organization and thinking through potentials problems, as well as making sure we’re working far enough in advance to not run out of time. The NW Kidney Kids Ball is important for funding our camp and for our year-round programs and scholarships, too. Running all our programs takes a lot of time-management and communication with volunteers. I am learning to let go this year and let Lauren and our committee chairs lead more. It’s been an interesting shift for me! Is there a magic number or ratio for a successful fundraiser? Jill: I like to see expenses below the 20% of revenue generated. But each event is different. New events might have higher startup costs, and galas are especially expensive. But each event engages donors and supporters in different ways. What are your strategies for continually bringing in donations to a nonprofit? Lauren: Ask -- and then thank, thank and thank some more! Jill: It’s important to communicate the impact of a gift to your organization. When people donate, they usually receive an email acknowledging a gift for tax purposes. The next step is thanking the donor and explaining exactly how their donation was used. What do you most love about this work? Jill: I love working for an organization that directly supports families and youth. As the organization gets older our youth are graduating, which has steered us toward new programs like our counselors-in-training and scholarship programs. We are looking at a way to support those kids as they transition into adulthood. For example, we just started a scholarship fund for Kidney Kids entering college or vocational school. Lauren: There is so much to love -- providing and growing a community for our kidney families, engaging other businesses in our mission and seeing a direct impact on the community. Plus, I get to work for and learn from a great boss and friend. I’m doing what I love! 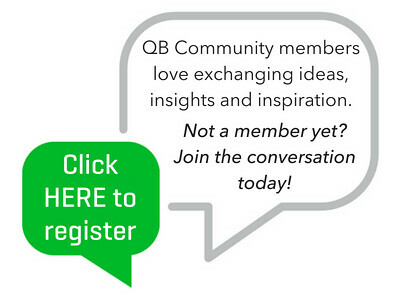 QB Community members, how do you or your business support nonprofits that you care about? "Share Your Spare" - that's so cute! This was a really wonderful and uplifting article. Thank you, Jill Brown (@jillyb4) for sharing your story, and best wishes for your family.